Most of us are sentimental which means we have feelings, including happiness, anger, sorrow and joy. Anger and sorrow may be harmful to our health, but they are inevitable parts of our daily lives. Letting anger go is not easy for most of us. Anger is bad for your companions and yourself. You should learn to face it and then get rid of it. By doing this, you may find your life is so amazing. 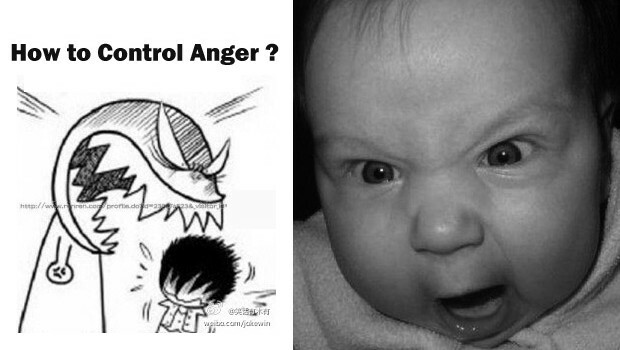 This article gives you some effective ways to help you to control your anger. Whenever anger strikes, think twice before you speak or make some actions. Close your eyes and take several deep breaths. It spares some time for you to think about why you are so angry and to clear your mind. Punch something to release your anger. A stress ball or toy is a good choice for you. Just picture them to be something that makes you angry. Treat them as you like if no one is on the spot. After the punching, you anger decreases and you may feel much better than before. Distract yourself from the anger thing. You can do something you like most and eat snacks. Shift your attention to something else. If you are staying at home, you can watch some movies and listen to some music. If it happens at non-work time, you can take some exercises which can help you to ease your anger and benefit your body at the same time. If it happens at work time, you need to think about it carefully and always be rational. You can leave the situation that makes you angry. Out of sight, out of mind. If you cannot face it directly, then leave the place. Find a friend to talk about it. Give him or her a detailed description about what happened right now. In the process of telling, you can reorganize your thoughts and have a better understanding of the whole situation. Your friends can also provide you with some insightful advice from a different perspective. Recall some positive memories and try to smile. Immerse yourself in good memories. It also can be called a distraction. Smile may be a challenge in this time. Just try you best or even force yourself to smile if some people beside you. Decrease the intake of sugar, especially for diabetic. Some people found that too much sugar is really bad for the social behavior. The reasons may be unclear, but try not to eat too much sugar for your own sake. Read some jokes since they can make you smile. Everything will be fine in seconds. Do some writing. Find a quiet place and prepare a piece of paper or notebook, then you can write down everything in your mind. It is a written form of your anger. Eventually, you will calm down and the anger disappears. Do some math. Math lets you become rational. Choose a difficult and doable math problem. By solving it, your anger level will be significantly lower. Use some lavender. Put them on your temples and wrists. Next morning, everything is ok. If you cannot control your anger, turn to a doctor. The best way is to face anger but not to walk away from your anger. Never release your anger on somebody else. They are innocent.